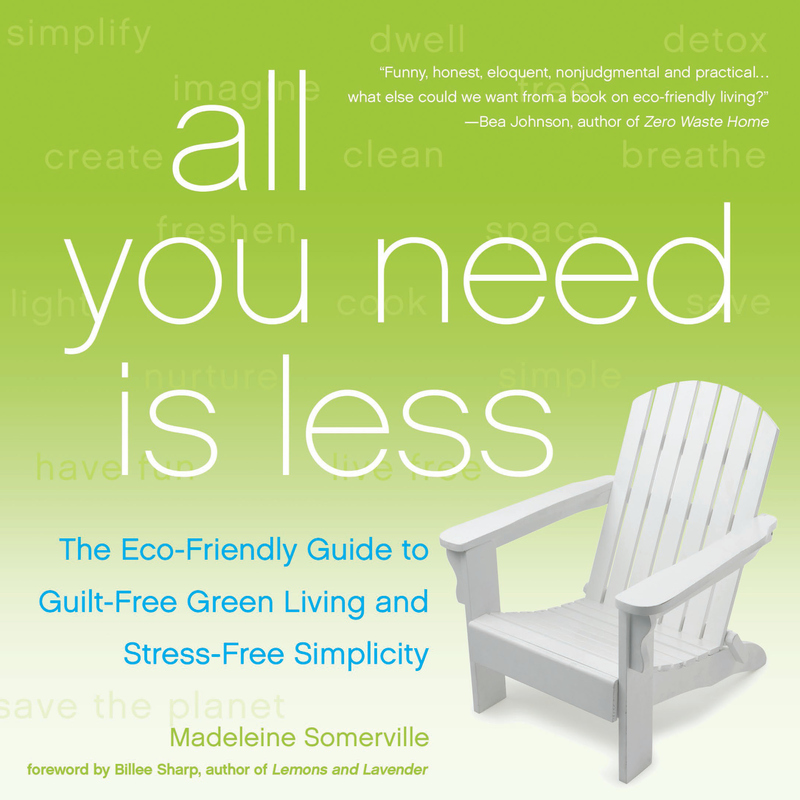 Seamlessly marrying essential content and entertaining anecdotes, author Madeleine Somerville’s All You Need Is Less is one green book you’ll actually want to read. This feisty how-to is divided into ten easy-to-read sections including Home, Beauty, Baby, and Pet, and delivers a straightforward approach to creating an effortlessly eco-friendly home. Madeleine Somerville shares recipes for all-purpose cleaners, laundry detergent, simple meals, and beauty fixes -plus a healing tea strong enough to cure even the worst Man Cold. Novice hippies will love the simple, easy to follow tips and tricks, while the experienced eco-holics among us will appreciate the back-to- basics approach to living an environmentally conscious life. With an emphasis on reducing consumption, simplifying your life, and playfully poking fun at preachy environags (you know who you are), Somerville has created a deliciously green addition to any library. Madeleine is thirty years old and often finds herself wondering how in the world that happened, exactly. She has a degree in Sociology with a concentration in Criminology, Deviance and Social control, and a baby tooth. She once spent three terrifying minutes with a 200lb albino python wrapped around her neck, and in 2009 her local paper ran an article shaming her for eating (and thoroughly enjoying) nachos from 7-11. She has never gone skydiving or bungee jumping, and never will. Woohoo, I just downloaded your book! I am so excited! I also already sent a copy to a fellow hippy friend on the east coast, she says she loves the book, too! I am so happy to hear that you are loving the recipes! Thank you for trying them 🙂 AND for passing the book along! YESS! I heard you today on NPR. My name is Kevin Moore. My wife Jayne and I own The Contemporary Issues Agency, Inc., one of the top lecture agencies in the U.S. primarily doing business in the college market. I was wondering what your speaking fee and availability would be, and if you would be interested in discussing exclusive representation in the college market? I’m from Wisconsin and also heard you on NPR. Loved the interview and downloaded your book. Will try the shampoo and conditioner tomorrow. Best of luck and I’ll spread the word! Log time hippie here, was at the summer of Love! I’m loving your book! Gems to incorporate (was out of earthy make up remover and discovered your tip re: coconut oil!) to get me even further on the continuum to green living! I just read and borrowed your book from the library. I loved, fun, funny and informative. Gold stars! I wrote out all the recipes and am using the shampoo. Only day 2 but hoping it works because all other shampoos make sores on my scalp after about 2 weeks. I have tried many, even made some but none as easy as yours. I am with you on the complicated recipes for making your own natural products. Yours are very clever, inexpensive and so easy. Love them. I am so sorry, I am taking a bit of a blog hiatus at the moment, hoping to get back into it at the beginning of February. I will be posting some info on raising a hippie- erm, “green” baby on this site soon though! I read your article published in the Guardian Weekly about consumption. It makes a lot of sense. I’ll look out for your book. Thank you very much. This is my fav green book! Love love love! It’s funny, helpful, practical, and very well written. Thank you so much for your time and effort into this book!